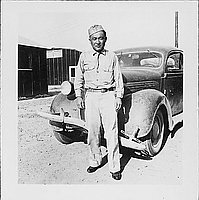 Man in United States Army uniform stands in front of a dusty two-door automobile at Rohwer concentration camp, Rohwer, Arkansas, August 20, 1944. 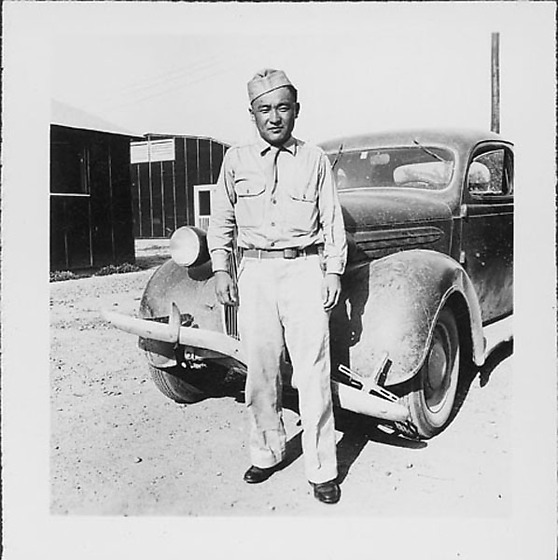 Dressed in light colored slacks, long sleeved shirt, necktie and garrison cap, man stands with his arms at sides in front of crooked front bumper. Car is parked on dusty unpaved ground. Tar papered barracks in background; utility pole, TR. Same man as in 97.292.3E and 3G. Written in pencil on back: AUG 20 1944.